January is a natural goal-setting time. The new year and its fresh calendar to fill out prompt a re-evaluation of how you want to spend your time and your resources. 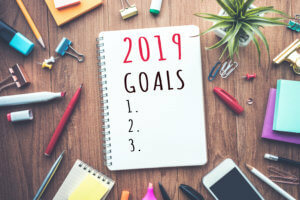 As you’re mapping out your 2019, MDA can fit into your fitness, financial and philanthropic goals — there’s an opportunity for every interest. Whether you’re interested in caring for kids at a weeklong MDA Summer Camp near your hometown, answering phones at a local office or organizing the biggest and best party for our gala series, MDA has a way for you to channel your skills and passions into meaningful differences for our community. Check out all the options and get started on your volunteer journey. Explore your neighborhood — and call your neighbors in to join you — for a walk or run that’s more than a workout. Team Momentum, MDA’s endurance training program, can get you ready to run 10K races or half- or full marathons, no matter what your experience level is to start. Meet families in your hometown at Muscle Walk, where a wheelchair- and equipment-friendly 1- to 3.1-mile course welcomes participants of all ages and abilities. Or set up a concert or bake sale, wash cars this summer, or collect gifts for MDA at your wedding — with Your Way for MDA, you can gather those you love in a project that aligns with your strengths as it strengthens our community. Whether you decide to donate on Facebook, on Giving Tuesday or on any Tuesday, a gift to MDA furthers our fight for a world free of muscular dystrophy, ALS and related neuromuscular diseases that take away strength and independence. And while you can make a quick and easy donation online at any time, you can give in other ways, too. Read more about Planned Giving to learn about how you can make a substantial gift over time in honor of those you know — and those you can help — living with neuromuscular disease.